Speak to Eluned in the Ithell section of Prifddinas. To begin, speak with Eluned in the Ithell section of Prifddinas. She will ask in your help in reforming Seren. Accept. Move towards the Tower of Voices and head upstairs to meet with the Elders. They will decide to bring Seren back. Lady Trahaearn will tell you that you'll need to go back in time to speak with an ancient elf about the ways of crystal singing. To do this, you'll need an enchanted key. If you don't have one, you can find it again by speaking to Jorral in the outpost above West Ardougne. Bring the key to Trahaearn and she will manipulate it for purposes in this quest. Begin to feel the key. You will eventually find yourself facing Guthix inside the Guthix Shrine east of Ardounge (you can simply teleport there using a sixth age circuit). 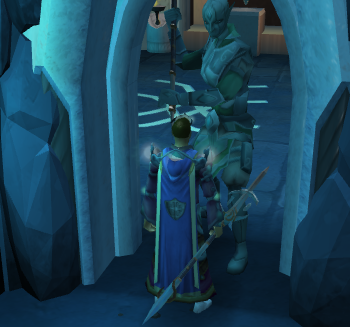 Once you are at Guthix, rub the key. Now Guthix will be alive. Speak with him. You should be able to infer you are at the end of the God Wars. Ask him about recreating Seren, and he will tell you that you'll need Seren's essence. Upon departing, he will alert you there is someone else in the room with you. Run back and speak to Haluned. Speak to her and then return to Guthix. After a quick conversation, you will teleport back to the present. There are five shards you need to find. The shard of Amlodd and Hefin. To start, you'll need three light cores. Light cores can be retrieved by killing shadow creatures in the Amlodd section. These will drop shadow cores, which should be thrown into the light rift. Upon doing this, there will be a chance that this core will be transformed into a light core. This part may take some time, perhaps 20-40 minutes. The experience you get from this is also pretty bad. Have fun! Once you have the cores, run north to the Hefin cathedral. You'll have to take part in a boring Elven ceremony. You'll have to do various poses (similar to serenity posts) then say an incantation three times. It's suggested to memorize the incantation words by their first letter, such as G-A-L-D-P instead of the actual confusing welsh words. Following this, you will get the spiritual shard. The shard of Cadarn and Iowerth. Speak to Arianwyn (in the Tower of Voices) to receive Baxtorian's Journal . Skim through this and head into Baxtorian Falls (this will require Glarial's amulet and a rope). Now head to the eastern room and search the northernmost crate for a key. Use this key to open the locked door in the western room. Continue on and investigate Baxtorian's statue. This will allow Arianwyn to reanimate Baxtorian. After a brief discussion with Baxtorian, you will obtain the shard. The shard of Meilyr and Crwys. Speak to Coeden the ent in the Crwys section of the city. Ask him about the Elixir of Revealment and he will tell you a boring story that you'll need to stay awake for. To do this, you'll need to click on the floating clan symbols before the screen becomes entirely black. After he has told you the story, you will receive a wintercup mushroom . The next mushroom can be found west of the mushroom patch in Tirannwn (it's best to use the Tirannwen lodestone and walk west). Pick it for the bloodcap mushroom . Now, add these to a grand defence potion (can be bought from the Grand Exchange) to get the Elixir of Revealment . Now you'll need to find an active crystal tree. This can be done by going to any crystal tree and investigating where it points. 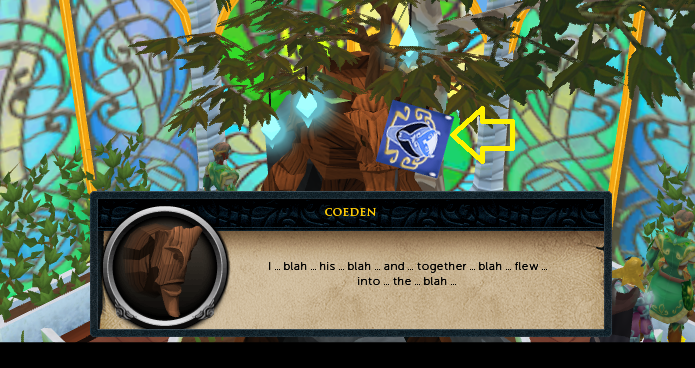 Or you could automatically teleport to one if you have a portal attuned to an active crystal tree in the max guild garden. Once you are at an active crystal tree, use the Elixir of Revealment on it. This will create a small cave entrance. Enter it to get your next shard. The shard of Trahaearn and Ithell. Speak to Lady Ithell about the shard. After that, run to Lletya and grab your exoskeleton suit (reward from Plague's End). Now climb down the well in front of the Lady Ithell statue and speak to the automaton. What material makes up the exoskeleton? What is the name of Lady Trahaearn's husband? How many Seren stones do the Trahaearn look after? Now the automaton will allow you to pass. Grab the seren shard and get out of Dodge. Return the shards to the correct elders. They will say one is missing - the shard of the Dark Lord. 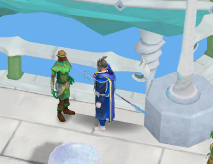 Run down to Morvran and ask him to let you into the Grand Library. Run west through the room Morvran puts you in and open the doors to access the Grand Library. In the southwest corner, you will find the dark crystal. You will have the option of picking up the crystal or leaving it there. This will affect Seren's personality. The choice is yours. Return the crystal. Unfortunately, Seren will not be good enough for reformation. More material from Tarddiad will be needed. Teleport or walk to the World Gate (the easiest way to get there is from the sixth age circuit teleport or Eagle's Peak lodestone). Dial the gate until you get a "1" symbol and enter it. Upon entering Eluned will tell you that you require 50 shards to reform Seren. Continue upon the path and you will be attacked by a crystal shapeshifter. The shapeshifter will adjust to your attacks, so you'll either be fighting against something that is strong against your attack style or switching attacks constantly. You don't have to kill it, but you can for two shards. From here, you can either collect shards or fragments. Shards - Shards are dropped two at a time by the shapeshifters. You need 50 shards to reform Seren, so you'll need to kill 25 shapeshifters. Fragments - Fragments can be found skilling around Tarddiad. You'll need 150 fragments to reform Seren. If you want to do attention intensive combat, kill the shapeshifters. If not, AFK skill until you have 150 fragments. After you have your shards/fragments, head north (across the river) until you find Angof near a fire. If you have fragments, you can exchange the fragments with her. If not, you'll still need to speak with her to unlock the final piece of the Elven restoration song. Teleport to Prifddinas and reenter the Tower of Voices. The ceremony will take place but a weakened Seren will form. Eluned will tell you to return Seren to Freneskae. Do so by either going through the Tower of Voices or the World Gate. After a cutscene, you will find yourself at the cradle, facing a muspah. You'll have to avoid its attacks, which can be easily done by walking back and forth. 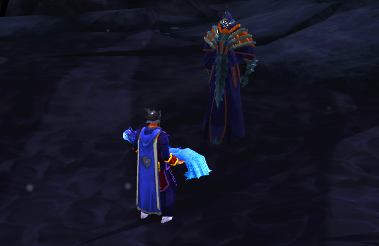 Eventually Zaros will come and kill the Muspah. Speak with Zaros. He will tell you that Seren's soul must be cleansed. He will take you to the Elder halls and you'll be left with a puzzle. The puzzle appears among the most difficult ones in RuneScape, but do not worry: you do not need to be an autistic savant to figure this one out! The idea is to get the light passing through both fractured crystals. This is a bit tricky because turning the crystals will turn other crystals (sometimes all crystals). But there is a pattern to the madness! There are three layers/rings of crystals: one on the outer edge of the puzzle, one in the inner part of the puzzle, and a final one between these two layers. To help you visualize this, (in puzzle 1) the outer layer has four crystals, the middle layer has five crystals, and the inner layer has two crystals. If you move a crystal one way, all other crystals in that layer will act the same way (e.g. move an outer crystal clockwise, all other outer crystals will move clockwise). However, how the crystals in the other layers react is different. Outer - Rotating the outer layer clockwise causes the inner layer to rotate counterclockwise and the middle layer to do nothing. Middle - Rotating the middle layer clockwise causes the inner and outer layer to move counterclockwise. Inner - Rotating the inner layer clockwise will cause the middle layer to move counterclockwise and the outer layer to do nothing. Puzzle 1 - Turn the outer layer clockwise twice. Turn the middle layer counterclockwise twice. Turn the inner ring counterclockwise once. Puzzle 2 - Turn the outer layer clockwise twice. Turn the middle layer clockwise once. Turn the inner ring counterclockwise twice. Puzzle 3 - The outer layer does not need to be moved. Turn the middle layer counterclockwise twice. Turn the inner layer counterclockwise three times. Puzzle 4 - The outer layer is turned counterclockwise twice. The middle layer is turned clockwise twice. The inner layer is turned counterclockwise twice. Following this, Seren will be brought back to consciousness. She will notice Zaros' lingering presence and give you more information about him. Then she will return to the elves and asks to not be worshiped by them any longer. After that, you will complete the quest. Congratulations, Quest Complete. Chronicle Absorption 75 Automatically absorbs chronicles while training divination, granting Hunter and Divination XP. 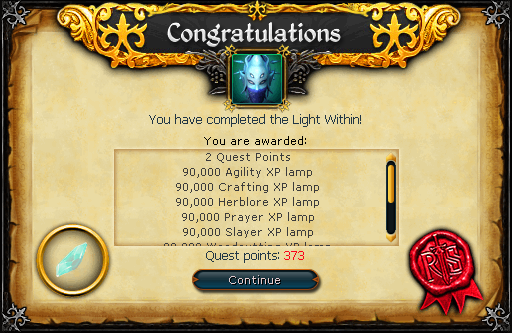 Light Form 80 Doubles the chance of Seren-aligned spell effects occurring when using abilities. Dark Form 80 Doubles the chance of Zaros-aligned spell effects occurring when using abilities. Soul Link 88 Equally shares all damage and healing with another player also using this effect. Teamwork Protection 89 Gives 5% damage reduction and 1% damage reflection for all nearby players who have the same prayer active. Stacks up to 5 times for a total of 25% reduction and 5% reflection. Note that the prayer only affects other players, so you'll need 6 players using it to get the full effect. Superheat Form 91 Automatically burns logs and smelts ore into bars for XP. Fortitude 94 Boosts Defence by 10%, life points by 100, doubles regeneration and allows regeneration in combat. Opal Aurora 75 Direct damage spell. Also restores lifespan on prisms. Prism of Restoration 76 Places a prism which heals nearby familiars and restores their special attack energy, and gives a chance to not use scrolls on familiar special ability use. Sapphire Aurora 77 Direct damage spell. Also overcharges prisms, adding useful effects on their next tick. Intercept 77 Redirects damage taken by the targeted player over the next three seconds to the caster, and reduces the damage to 95% of the original hit. Emerald Aurora 79 Direct damage spell. Also applies a stacking 1% damage reduction buff to the caster. Stacks up to 5%, and with other damage reduction methods. Superheat Form 81 Automatically burns logs and smelts ore into bars for XP. Prism of Salvation 80 Places a prism which players can click to teleport near to, as long as there's a clear path between. Ruby Aurora 81 Direct damage spell. Also has a chance to apply a 1% damage buff to nearby allies. Stacks up 3%. Prism of Loyalty 82 Places a prism into which players can funnel life points. Anyone doing so will take damage, and the prism will automatically heal nearby players with 75% or lower life points. Shield Dome 84 Deploys a static dome that allies can stand within to reduce incoming damage by 50%. Domes cannot be layered on top of eachother, and new shield domes affecting a player within 2 minutes have diminishing returns. Prism of Dowsing 86 Places a prism which attracts wisps to it and increases the chance of drawing enriched wisps. All nearby players can benefit from this. Crystallise 88 When cast on mining, fishing or woodcutting spots - or full box traps - will cause the resource to persist for 30 seconds, yield no resources and give increased XP. Other players may still deplete the resource, but Crystallise will carry on when the resource is back. Rapid Growth 88 Skips a tree, fruit tree or herb patch forward a growth stage. Usable once per day on each eligible farming location. Crystal Mask 90 Gives +15% to pickpocketing chance and gives a chance to avoid damage and stun on failure. Spellbook Swap 96 Identical to the Lunar version. The shapeshifters and skilling nodes will remain on Tarddiad after completion of the quest. They can be used for getting crystal shards. Crystal shards can be turned in to Angof for crystal armor. Crystal armor is level 70 hybrid. There's also attuned crystal armor, which is tier 80 hybrid. Both styles degrade.